Our linear, dual-surface PACS radiology tables with large workspace and motorized sit-to-standing height-adjustment with 2 presets for each surface operated from a single switch. 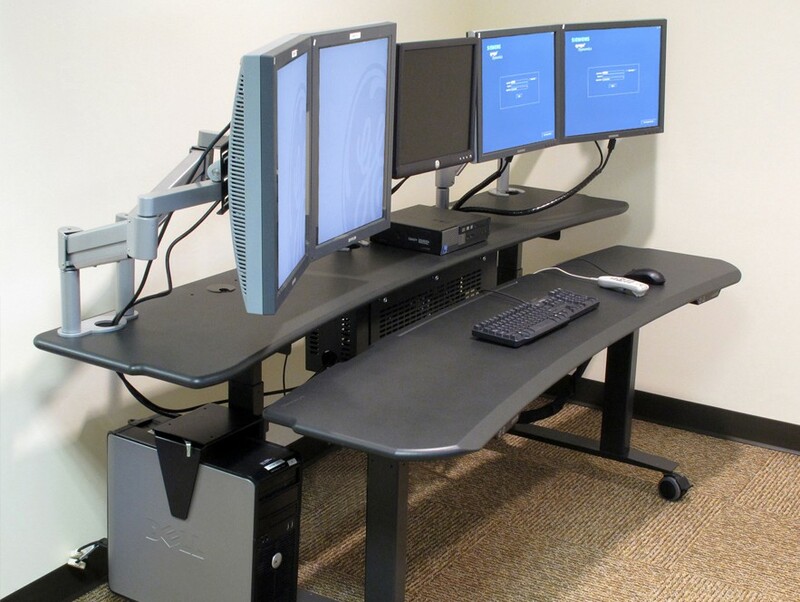 This table utilizes 2 actuators under each surface to provide 360lbs of lifting power which is adequate for 3- 8 monitors depending on table size. This is a rock-solid platform with full BIFMA approved adjustment ranges of 22'1" - 48.6" and features our trademark Comfort Edges and solid surfaces with our baked-on non-reflective lacquered finish. Available in 4 sizes to suit various configurations up to 8 monitors that can be combined with our PACS radiology specific Add-Ons for an efficient and organized reading environment (see 'Select Your Add-Ons' above and choose your preferred options) . Great for all professional and commercial applications where stability and reliability are desired. Maximum workspace and multiple monitor support for PACS and professional applications. • Four sizes: 60" (up to 3 monitors), 72" (up to 4-5 monitors), 84" (up to 5-6 monitors), 96" (6+ monitors). • Bi-level sit-to-stand motorized adjustment with 2 height presets for each surface and our signature solid surface ComfortEdges. 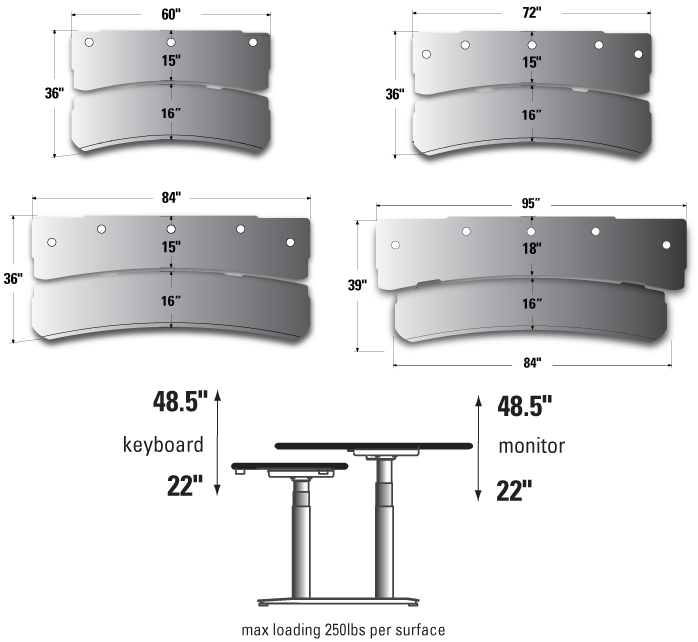 • High sit-to-standing adjustment range is ANSI-BIFMA rated 22.1"-48.6", with 1.5" per second adjustment speed, and 360lbs loading (not incl tops) per surface. • Extra heavy-duty all steel frame for stability and reliability. 96" version has 3 legs under rear surface w/540lbs loading (not incl. tops). • Built-in wire management grommets and levelers. • 2 Linak motors per surface run on standard 110volt power, 220volt available. Soft start and stop, zero energy draw when idle - 3 motors on 96" rear surface. • Optional heavy duty locking casters for mobility. • Add our optional PACS radiology add-ons, including an extensive range of adjustable monitor arms, and CableCab for maximum cable and outlet management.